LOS ANGELES — Netflix has reached an agreement to resume production on "House of Cards" season 6 — the show's final season — in early 2018, according to chief content officer Ted Sarandos. Production of "House of Cards" season 6 was suspended in October, following sexual assault allegations against star Kevin Spacey. Season six of the political thriller will be eight episodes, starring Robin Wright. The final season will not include Spacey, as previously announced. "We were really excited we could get to an agreement... for the conclusion of the show," said Sarandos, speaking Monday at UBS's Global Media and Communications Conference in New York. 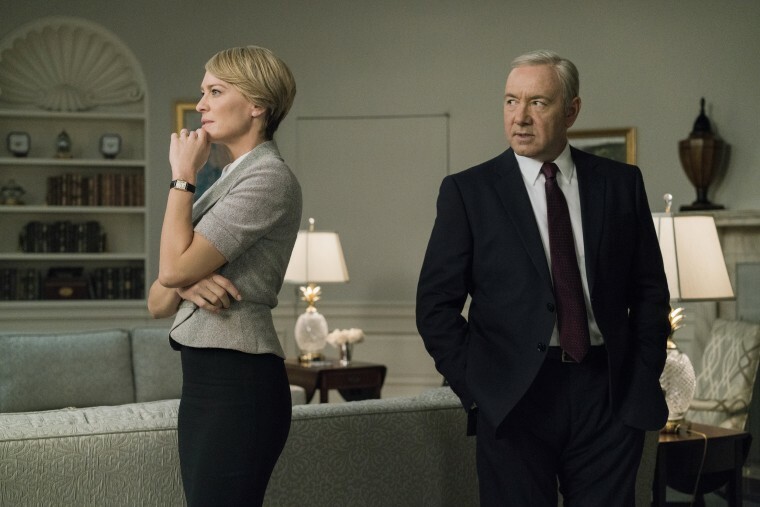 "House of Cards" is produced by Media Rights Capital (MRC) for Netflix and is shot in Baltimore. Sarandos said he was gratified to have reached the deal for the team of 370 people who directly work on the show and for "the 2,000 people in Baltimore" who have jobs working on "HOC." Netflix, already a huge buyer of programming, is jacking up its content budget for 2018 — projecting it will spend between $7 billion and $8 billion, up from $6 billion this year. The streamer's content slate for next year includes around 80 original films through productions or acquisitions, Sarandos reiterated, which he'd told investors on Netflix's earnings call in October. One-third of all viewing on Netflix is of movies, he said. For most movies, theatrical release is a "lousy business," he said. "The question is, can you shake up the market enough for big event movies to be only on Netflix?" He said he's hopeful theaters would screen a movie like "Bright," the Will Smith cop movie set for Dec. 22 release, "because people want to go out on Friday night." Sarandos also said Netflix will expand animated feature films, potentially releasing four or five per year, and has 60 kids' series in production along with 30 anime originals from Japan. In addition, Netflix will ramp up local-language productions, targeting 30 international scripted series around the world in 2018. "We've been careful to not become a one-brand network. The way to do that is having a lot of variety, and executing in multiple genres at a high level," Sarandos said, noting Netflix has made forays into unscripted shows and stand-up specials. Last week, Netflix renewed hit supernatural series "Stranger Things" for season 3 and David Fincher's "Mindhunter" about FBI serial-killer profilers for season 2, while it cancelled "Haters Back Off" featuring YouTube's Miranda Sings (created and played by Colleen Ballinger) after two seasons. "The returning-series phenomenon is really exciting," Sarandos said, adding, "Last year, there was zero anticipation of 'Stranger Things'" before the show from the Duffer Brothers became a huge franchise. For "The Crown," the Queen Elizabeth II series that reportedly had a budget of about $170 million, "almost all the press was about how much it cost," Sarandos said. But in fact, he said, it's "one of our most efficient shows" in terms of the number of people who have viewed the show and its ability to attract new subscribers. The second season of "The Crown" debuts Dec. 8.